Chick MacGregor produced hundreds of other transcribed series, music albums, Government-commissioned series', and educational features. 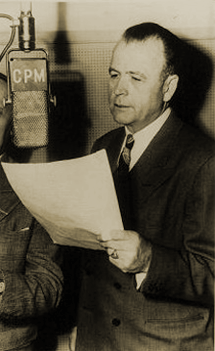 Referred to as the "deMille of the discs" during the Golden Age of Radio's heyday, thousands of C. P. MacGregor's transcription discs and manuscripts from the era are currently preserved in the C. P. MacGregor Collection of the Library of Congress. Suspense and thriller mysteries were a popular staple of Radio from its Golden Age. We're all familiar with the long-running Suspense and Escape programs from the era. There were literally hundreds of other similar productions that found their way to American air waves throughout the Golden Age of Radio. 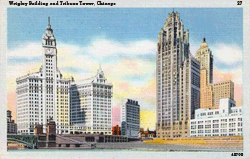 During WBBM's programing development heyday of the late 1930s and throughout the 1940s WBBM originated numerous public service, drama, variety and soap opera programs for airing throughout the Midwest, many of which were picked up by CBS for national broadcasts. WBBM also aired a great many independently produced, transcribed and syndicated programming throughout the Golden Age of Radio. 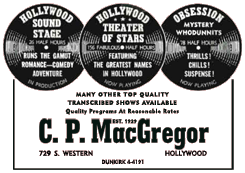 C. P. MacGregor's offerings over the years were an equal mix of independently produced, Government-commissioned, and commercially-commissioned productions. Obsession was an example of one of C. P. MacGregor's independently produced series. Obsession's first subscriber appears to have been WBBM, Chicago; at the time, the CBS Key Station for Chicago and the midwest. WBBM launched MacGregor's Obsession series on October 9th 1950 as a filler program until January 15th 1951 at which time it began airing on a Monday night regular basis until May 12th 1952. Run Dates(s)/ Time(s): 50-10-09 to 52-05-12; CBS [WBBM, Chicago]; Seventy-eight, 30-minute programs; Sundays then Mondays. On Tuesdays, a new program "Obsession" will tell strange and unusual scories of people whose experiences prey on their minds. resembles exactly. The man he is asked to impersonate had allegedly been killed in a plane accident leaving a woman behind, who, not knowing he had been killed, awaits his return. Sullivan who is himself suffering from amnesia meets the girl and becomes obsessed with the idea he might actually be the man he is impersonating. TUESDAYDonald Crisp stars in "Shadow and Substance" this week's story of "Obsession" at 9:30 p.m.
TUESDAY"Cry Vengeance" is this week's tale of "Obsession" at 9:30 p.m.
Information on C.P. MacGregor and his family is somewhat sketchy, but he remains one of the more fascinating icons of the era of The Golden Age of Radio. In 1924, MacGregor was Brunswick Records' manager for the San Francisco territory. He later founded his own studios--C.P. MacGregor Studios--at 729 S. Western Avenue, Hollywood, CA. He was referred to as "the DeMille of the discs."